History of Donald Trump's campaign for President. President Donald Trump's historic run for the Presidency started on a escalator ride in Trump Tower on June 16, 2015. In Donald Trump's speech he brought up many domestic issues. One of the issues Donald Trump brought up was illegal immigration, Donald Trump promised to stop illegal immigration and build a wall between Mexico and the United States. Donald Trump also talked about American jobs leaving this country, trade and the national debt, as well as Islamic terrorism. Donald Trump announced his campaign slogan which was "Make America Great Again". Donald Trump also declared that he would fund his Presidential campaign from is own wealth and would refuse any money from donors and lobbyists. Right after entering the race for President almost all political pundits declared Trump's candidacy as a joke and basically gave him a zero percent chance at winning the Republican nomination for President. Part of Donald Trump's campaign was giving nicknames to his opponents. His first nickname he gave out was to Jeb Bush. Donald Trump attacked him for his lack of energy and enthusiasm on the campaign trail. Thus he was giving the nickname "low energy" Jeb. Shortly after the Iowa Caucus Donald Trump gave Ted Cruz the nickname "lying" Ted. Ted Cruz campaign was caught up in a few lies and questionable campaign tactics making the name suitable for him. Towards the end of the primary campaign Marco Rubio got more aggressive with his campaigning against Donald Trump. Donald Trump gave Marco Rubio nickname of "little" Marco. Donald Trump also referred to Marco as "lightweight" Marco, and choke artist. His most notable nickname was giving to his general election opponent Hillary Clinton. She was given to name "crooked" Hillary, referring to her secret email server containing classified information, and referring to her other scandals throughout her time as Secretary of State, Senator from New York, and as First Lady. Throughout the entire 2016 Republican primary campaign Donald Trump was always located at the center of the stage on the debate stage due to leading the field in poll numbers. During the primary debates, Donald Trump was known for his outfront comments and quick comebacks. Basically every candidate that attacked Trump was shut down during the debate. When Donald Trump attacked back everything was on the table. The catch phrase for Trump's debate performance was "you can't stump the Trump." The video below is a completion of all of Donald Trump's best comebacks during the 2016 Republican Primary debates. Donald Trump held huge rallies during the primary campaign and general election. In total Donald Trump held 299 campaign rallies. Donald Trump's rallies often filled up sports arenas and stadiums. None of his primary opponents held rallies even close to matching the size to Donald Trump. Many of his opponents would give speeches in coffee houses or restaurants. 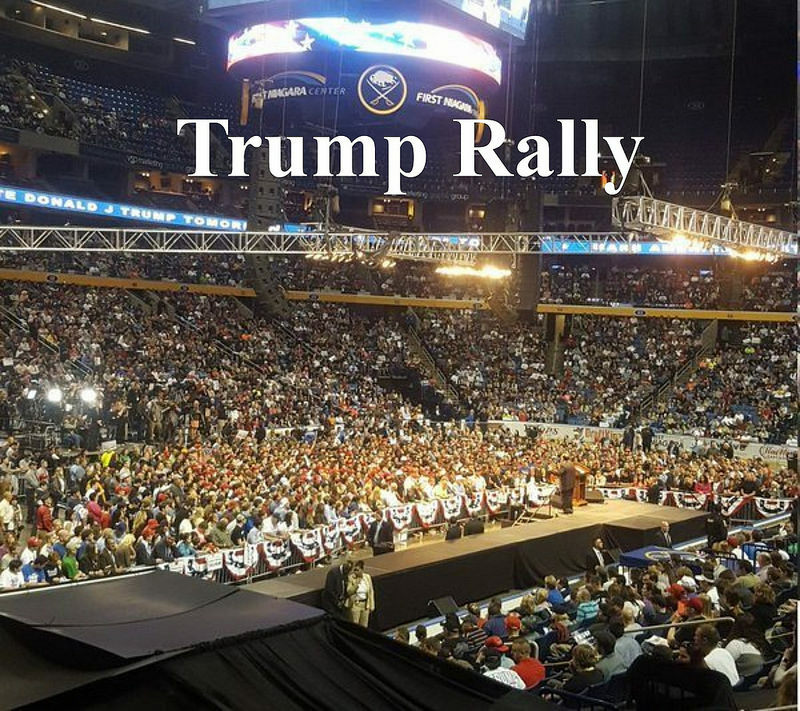 During the general election Hillary Clinton would fill up middle school gyms with a few hundred people and Donald Trump would fill up stadiums and outdoors venues with thousands of people. The Clinton campaign was known for taking certain angled pictures to give the impression they have more people than they actually have at the event. Towards the end of the campaign, Tim Kaine held a rally in Florida and the rally was meant to hold hundreds of people and only attracted a few dozen. According to the polls Donald Trump was leading in most of the early primary states. The first contest was the Iowa Caucus. Some polls showed Trump leading in Iowa but Ted Cruz went onto winning the state. Ted Cruz was accused of stealing Iowa because his campaign put out emails saying Ben Carson was intending to drop out of the race and if you support Carson you should vote for Ted Cruz. After Iowa Donald Trump went on to win the New Hampshire primary and the South Carolina primary by huge margins. Wins in those two states effectively pushed most of the candidates out of the race leaving just Ted Cruz, Marco Rubio, and John Kasich. After Rubio lost his home state of Florida, Rubio dropped out. There came a point in the race where John Kasich lost so many states that there was not enough delegates left for Kasich to gain enough delegates to win the nomination. Thus he was mathematically eliminated. Although Kasich stayed in the race to be a spoiler in hope of a brokered convention. Ted Cruz was Donald Trump's main opponent. They battled for a while during the primary with Trump winning most of the states and delegates. Soon enough the Cruz campaign found themselves in the same position as the Kasich campaign with not having enough delegates available to win the nomination. Like John Kasich, Ted Cruz says he would stay in the race to try to force a brokered convention. On May 3, 2016 was the Indiana Republican Primary where many said was Ted Cruz's last stand against Donald Trump. Donald Trump beat Ted Cruz handedly in the state and Cruz left the race with John Kasich dropping out soon after. After becomes the presumptive Republican nominee, Donald Trump reorganized his campaign, by hiring new staff members. One notable person he hired was Kellyanne Conway who would go on to be Trump's campaign manager and would be the first female campaign manager on a winning campaign. One of the first tasks Donald Trump had to do as the Republican nominee for President was to select a Vice President. There were many names being reported for a possible Vice President for Donald Trump. However the tops names being speculated for Vice President were Newt Gingrich, Chris Christie, and Mike Pence. On July 15, 2016, on Twitter, Donald Trump announced he selected Indiana Governor Mike Pence to be his Vice Presidential candidate. Donald Trump used many attack lines against Hillary Clinton. The main subject of his line attacks against Hillary was that she was a corrupt, all talk, no action career politician that will say anything and do anything to gain power and to get elected. He used Hillary's record as first lady and as New York Senator to do this. He also attacked her over scandals resulting from her time as Secretary of State. The most notable scandals was Benghazi, secret email server with classified information, and the foreign contributions to the Clinton Foundation. You can see a small list of the many Hillary scandals on our Never Hillary page. During the debates, Donald Trump's mannerism were very similar to that of his performance during the Republican primary attacks. Donald Trump attacked Hillary very directly over her record and had quick comebacks to Hillary's line of attacks. Below is a video on what I think is the best Trump line throughout the entire Presidential campaign plus a little extra. Below is a video of some of the best lines from Donald Trump during the second Presidential debate. Below is a video of some of the best lines from Donald Trump during the first Presidential debate. Below is a video of some of the best lines from Donald Trump during the third Presidential debate. Going into election basically all media outlets and pundits said Hillary Clinton was going to win. The only thing these political commentators differed on was how big of a win Hillary would have. As the results came in the story was very different. The issue was not if Trump would win but how much he will win by. Donald Trump ended up winning Wisconsin, Michigan, and Pennsylvania. All three of these states have not voted for a Republican since the 1980's. 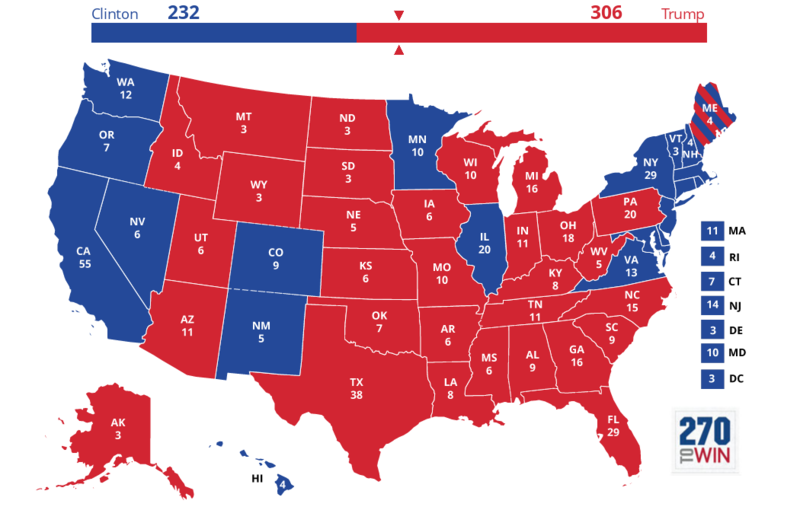 Most pundits did not believe Wisconsin was even a swing state and most agreed Hillary would end up winning Pennsylvania and Michigan. Trump also won Iowa, Ohio, and Florida which Barack Obama won twice. Trump won Iowa and Ohio by very large margins the polls said those states were suppose to be close.